Just Northwest of Chicago lies a haunted attraction that has one of the creepiest, most authentic locations that you’re ever likely to encounter at a haunted attraction. 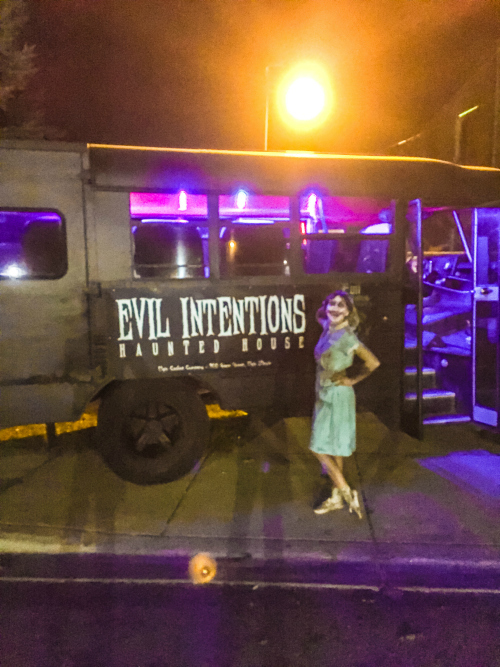 Housed in an early 20TH-century building that was once home to the former Elgin Casket Company, Evil Intentions is one of the most original and creative haunted attractions that this review team has ever had the privilege of visiting. Now in its 13th season, this haunt should be considered one of the “Must See” haunts of the Midwest, if not the entire country. 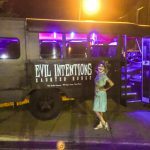 We visited Evil Intentions on opening night back in Mid September. We were so blown away by our experience that we decided to make the 4-hour trip again in late October! We rarely visit an attraction more than once a season, but once in a great while we come across a haunt so special it deserves multiple visits. We feel that the cast is the most important aspect of what separates the great haunts from the meh ones. Unfortunately, it isn’t very often that we come across a great cast as typically there are either not enough actors, or some of the performances leave something to be desired and sometimes both. But this was not the case with Evil Intentions. Actually, we wouldn’t rate the actors here as “great,” as “stellar” seems to be a more appropriate word used to describe the amazing cast of characters we encountered during our visit. We were thoroughly impressed at how well each and every character fulfilled their roles as the actors who provided quick startles were just as effective as the ones who spoke more meaningful dialogue. We honestly didn’t come across one subpar performance during the entirety of both of our tours. It was quite apparent to us that the cast here love what they do as evidenced by the enthusiasm of the performances and the commitment to their roles. The actors in the cage maze deserved a special mention for their “acrobatic” efforts and their ability to move so quickly and effortlessly. But of all the excellent performances we encountered there is one actor in particular that we feel really stood out and that is the Doctor. Everything about his performance was amazing, from the highly original dialogue to the sound of his voice and the creepy body language. We don’t want to give anything away but we will say that he really took us out of our comfort zone by directly involving our group in the scene and made us question whether or not he was actually acting. If we were giving out awards, the Doctor at Evil Intentions would most definitely win “Actor of the Year” with a performance we shall never forget. The entire cast really deserves to be applauded as they are a testament to what makes a haunted attraction truly great! The costuming and makeup work was very well done and quite excellent overall. Everything looked authentic, professionally done and custom made for their characters. Some of the things we noticed were colored contact lenses, professional quality makeup work including prosthetics, Hollywood quality masks, and custom-made attire. We saw quite a few costumes we had never seen before, including many highly original creations. The costuming as a whole looked complete, believable, and appropriate for different characters roles. 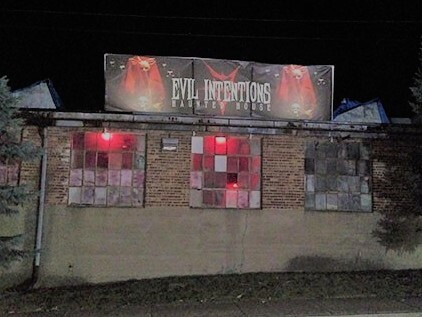 Evil Intentions’ location is easily accessible with free parking available in a large paved lot directly across the street. There are plenty of public restrooms on-site as well as a gift shop selling really cool Evil Intentions merchandise. We found everything to be well organized, even on the night we visited when there was a record crowd on hand. We noticed quite a few roaming actors entertaining the crowd not only in the queue line but also around the exit and parking lot areas. These characters excelled at keeping the customers engaged with their amusing antics and frightening interactions. The staff here are about as friendly and helpful as they come. The owner is very passionate about his attraction and was eager to answer our questions. Evil Intentions does a great job of preparing you for your journey by setting the mood before you enter the attraction. Outside there was an Evil Intentions bus parked out front, colorful lighting around the entrance, loud music playing, videos projected on the side of the building and lots of roaming actors. Inside was just as impressive with a creepy looking ticket booth and queue line with dramatic lighting which got us really excited to enter the attraction. But the best part of the atmosphere is the building itself; an imposing, decrepit early 20th century brick structure which formerly housed the Elgin Casket Company. We could not imagine a more perfect setting for a haunted house. What really stood out to us regarding the effects is their creativity and originality. There were many sights and sounds that we have never seen or heard ever before. We found several of the scenes to be so original and creative, they looked as if they were created by the mind of a disturbed artist rather than a normal set designer. 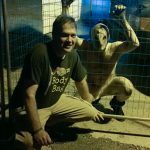 While we didn’t see a lot of high-end animatronic creations, what we did see were beautifully detailed sets, excellent lighting, great sound effects including a heart-pounding soundtrack and some of the most authentic scenes we have ever come across in 20 years of touring haunted attractions. We were especially impressed by two-story altar and basement areas, as both made us feel as if we were no longer inside an attraction, which is quite a rare feat indeed. 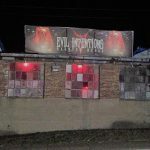 We don’t usually enjoy mazes as we quite often find them to be nondescript and boring, however, the maze at Evil Intentions is an entirely different animal. 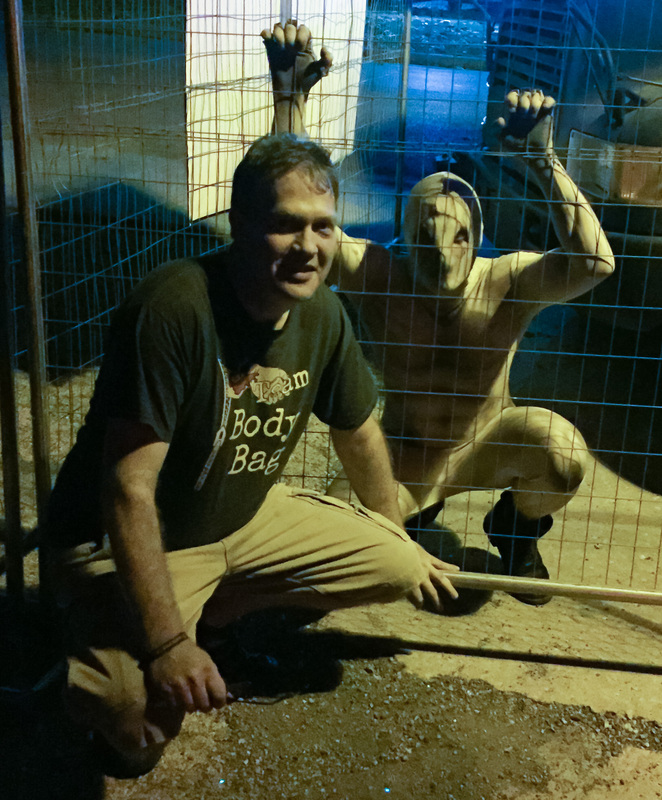 It is without question the most original and creative maze we have ever encountered, and with the exception of the blackout maze at Reapers Revenge in PA, it is also the most intense. We’ll touch upon that intensity later in the review under the Fright Effect category, but for now, we will say that this maze is a stroke of genius and it couldn’t be more fitting in regards to the history of the building. The theme for Evil Intentions is titled “The Ritual” which is based on Satanic Cult activity and several unsolved murders that have been documented in the building that houses the haunt. You couldn’t ask for a more authentic location, that much is for sure! We found the theme to be well executed as the majority of the sets, script, characters roles, and costuming fell in-line with the overall backstory. We found “The Ritual” to be one of the most original and creative themes of any haunt that we have ever toured. 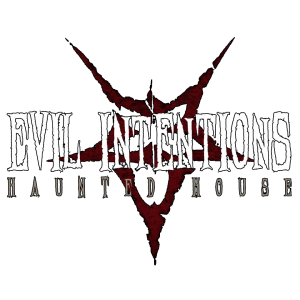 Lets us start by saying that Evil Intentions is one of the scariest haunted attractions we have ever visited. We experienced a wide array of very effective scare techniques which we found to be very unpredictable. Some of the different techniques we encountered were distractions, “pop” scares and prolonged interactions in which we became immersed in the scene. While there were a few really good environmental frights in the beginning and near the end, most of the scares came from the stellar cast. We never saw these scares coming primarily due to the excellent hiding spots and great timing of the actors. The cast as a whole was quite intense and they really took us out of our comfort zone. One area that didn’t need the help of the cast to get us to feel “uncomfortable” was the maze. The maze here is truly one-of-a-kind and certainly not for the claustrophobic or timid. It was a very intense experience and we can honestly say that, at times, we genuinely questioned whether or not we would make it out at all. There was another “one-of-a-kind” moment which was one of the most suspenseful we have ever encountered. We don’t want to give the surprise away but this is the best example we’ve seen to date of a scene that makes you worry “what’s real and what’s not.” To sum it all up, we will say that if you’re looking for a haunt that will scare the sh*t out of you, Evil Intentions IS the place. General admission is priced at $25 and a VIP Fastpass is only $10 more at $35. 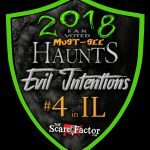 We visited Evil Intentions twice in 2017. The first visit was near closing time on opening night in which were able to walk right up to the ticket booth, purchase our tickets and enter the haunt in less than 5 minutes. 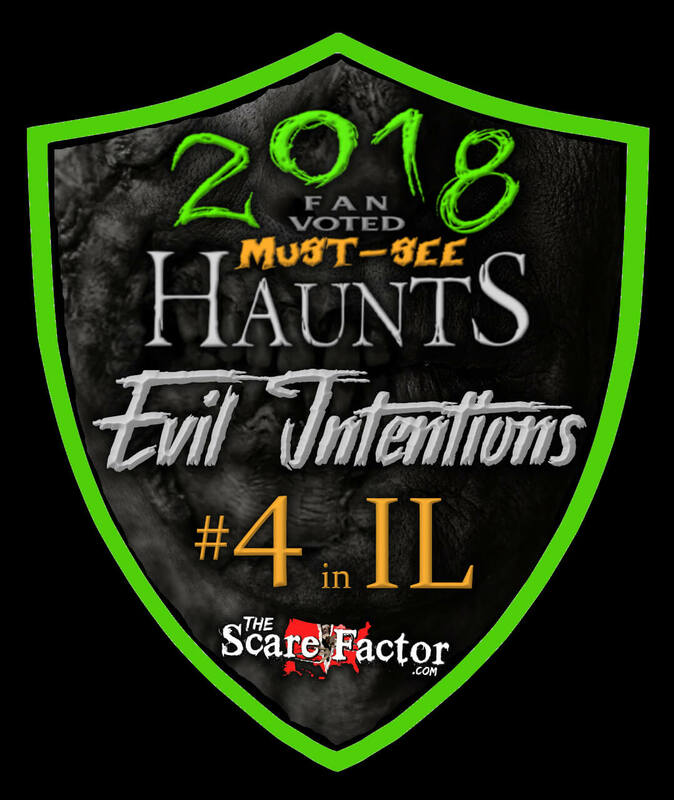 Our second visit was during the 3rd weekend of the October, which is typically the busiest weekend of the season for haunted attractions and on this particular evening, Evil Intentions was experiencing a “record night attendance wise,” according to the owner. The wait in the General Admission line was well over 2 hrs making the $10 up charge for a VIP ticket a wise investment, to say the least! During our first visit, it took our group a total of 30 minutes to get through from start to finish and 21 minutes during our second visit, for an average time of 26 minutes which gives us a MPD (minutes per dollar) score of 1.04. We feel this haunt provides a very good value for the money spent because they entertainment provided is stellar and the use of available space is very well done. Evil Intentions impressed us so much this season that we are already counting the days until we can visit again in 2018!